The third and final part to the Legend of Spyro trilogy. Three long years have passed since Spyro and Cynder were trapped in the crystal, since then Malefor has unleashed his evil onto the world. In this third chapter of the epic Legend of Spyro trilogy, Spyro must fulfil his destiny and face the Dark Master. 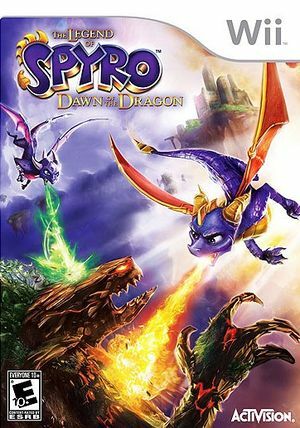 As evil spreads over the world, Spyro and Cynder must discover new abilities and unlock their true powers to defeat Malefor and stop him from destroying the world. The graph below charts the compatibility with The Legend of Spyro: Dawn of the Dragon since Dolphin's 2.0 release, listing revisions only where a compatibility change occurred. r5287 Windows 7 Intel Core i7-920 @ 4.05GHz ATI Radeon HD 4890 The game can be played at full speed's in HD when fraps is not recording. This goes to show that with a strong enough PC Wii games on dolphin can be emulated quite well. The game does suffer from a sound bug which makes the audio excruciating to listen to. The music is fine, the sound effects are just being encoded incorrectly. I have added some of the games audio into the video where it is tolerable to listen to. 4.0.2 Windows 7 Intel Core i7-3930K @ 4.3GHz NVIDIA GeForce GTX 770 The game has minor audio glitches (the audio is perfectly fine at 100% speed) and majior performance problems and can barely manage 60FPS, but keeping it at 60FPS in fights its impossible, changing graphics settings does little if anything in terms of gaining extra frames. The game can be played through to completion. 4.0-3471 Windows 7 Intel Core i7-3930K @ 4.3GHz NVIDIA GeForce GTX 770 Graphical glitches in menus and pre-rendered cutscenes (in-engine cutscenes are fine), framerate cuts in half when breaking crystals. other than these issues the game runs perfectly with no issues at all. This page was last edited on 16 January 2018, at 03:46.